The 43rd annual boating and fishing exposition will return to San Diego area, March 28-31. DEL MAR—The 43rd annual Fred Hall Show is back, bringing anglers, boaters, hunters and outdoor enthusiasts to the Del Mar Fairgrounds, March 28-31. Fred Hall in Del Mar is the largest outdoor recreation show in the nation’s fifth largest market brings. Patrons attending the world’s largest consumer fishing, trailerboat and outdoor recreation show production will also find a wide selection of shooting sports gear and travel/vacation opportunities. Fred Hall’s Del Mar show will highlight the latest recreational boat models, fishing gear and tackle, outdoors accessories, seminars and family-friendly activities. 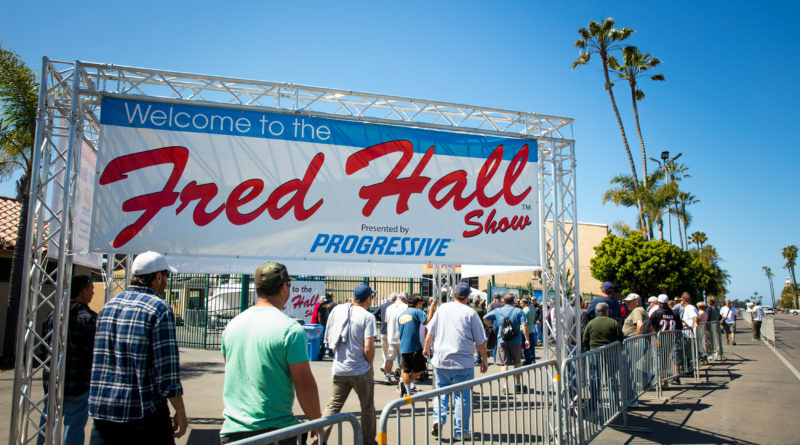 The Del Mar show marks the third of three Fred Hall Show productions this year; the other two were in Long Beach (March 6-10) and Bakersfield (March 15-17). Be sure to visit The Log/FishRap booth, where you can sign up for a free digital subscription and e-newsletter. Signing up also enters you into a competition for a grand prize drawing of the Riviera Paddlesurf Standup Paddleboard. The winner will be announced after the conclusion of the Del Mar show. Doors at the Del Mar Fairgrounds open March 28; the show continues through March 31. More than 500 vendor booths will be in attendance and 200-some seminars will be featured at this year’s show. Attendees will also be able to peruse acres of boats on display. Fred Hall Shows’ Del Mar event originally started at the Golden Hall in Downtown San Diego. The exposition now features nearly one million square feet of indoor and outdoor space filled with boats, campers, RVs and other outdoors equipment. Highlighting this year’s show are several family fun activities, such as the San Diego Ford Dealers Paul Bunyan Lumberjack Show, SoarDist Great American Duck Races, Mammoth Lakes Kid Fish Free Trout Pond, Casting in the City Kids Casting contest, Daiwa Kids Touch Tank, saltwater and bass fishing seminars, Costa Sporting Chef Cafe and the Ultimate Air Dogs. There will also be ranges for air gun and archery, fly casting, motorcycle racing demonstrations and Mammoth Lakes seminars. Another focal point at this year’s Del Mar show is San Diego’s largest marine electronics display and a collection of international hunting and fishing resorts. A few vehicle manufacturers will have new cars and trucks on display, as well. Instructional seminars will offer attendees information on fishing local lakes (which are experiencing rising water levels due to the recent rains), catching freshwater and saltwater fish from a kayak and one-on-one tutorials on fishing techniques. Sponsoring this year’s show at Del Mar are Progressive Boat, 805 Beer, Hobie Fishing, Shakespeare, and Mammoth Lakes. Fred Hall Del Mar Show hours are noon to 8 p.m. weekdays on March 28 and 29, 10 a.m.-8 p.m. on March 30 and 10 a.m.-6 p.m. on March 31. Admission is $15 for adults, $13 for seniors (62 and older) and $10 for military personnel with valid identification. Children 15 and younger can enter for free with a paid adult. Buy tickets in advance at fredhall.com/san-diego or in person at the door. For more information visit fredhall.com. Anyone who joins the Coastal Conservation Association – California (CCA-CAL) can enter the show for free. The Del Mar Fairgrounds is located at 2260 Jimmy Durante Boulevard in Del Mar.